Mon., April 30, 2018, 7:16 p.m. This is the story of two sports-related injuries. We start with the great Stephen Curry. In early March, the 29-year-old Golden State Warriors superstar landed awkwardly on his chronically-injured right ankle after a layup attempt, sidelining him with a sprain for the fourth time this season. Two weeks later, in Curry’s first game back, teammate JaVale McGee fell onto his left knee. This time, a Grade 2 MCL sprain in that knee sidelined Curry, and he missed the rest of the regular season and the first round of the NBA playoffs. Curry is very, very, very valuable to the Warriors family, and he has been sorely missed. We now turn to the not-so-great Couch Slouch – that’s me!!! A couple of months ago, while walking Daisy, our 90-pound pit mix, I stepped into a sprinkler ditch and tweaked my left ankle. Unlike some NBA superstars, I played through the pain. Then, on a late mid-April evening, I was sitting on the front porch with Daisy. I got up to go inside and told her, “C’mon.” She didn’t move, flashing her “make me!” look. A moment later, standing only a couple of feet behind her, I saw Daisy’s body language change a split-second too late. As I shouted, “Daisy, no!” she bolted down the front-porch steps. I was mortified. She had never taken off before and I feared for whatever lay in the distance. Had she seen a dog? A cat? Skip Bayless? She had never shown the slightest aggression toward anything, but she was a rescue – perhaps she spotted some old adversary from the shelter with whom she had a longstanding beef. I wanted to beat myself up for stupidly not having her on a leash, but all I could do at that instant was chase after her. So I bounded down the front-porch steps and, well, that’s as far as I bounded. I tripped on those steps and sprawled across the pavement, landing awkwardly on my left ankle. I got up, immediately felt extraordinary pain in my left leg but resumed running after Daisy; if you all knew Daisy like I know Daisy, you would’ve done the same. Thankfully, Daisy was just one house down, guiltily standing on the sidewalk, with nothing in sight. But after she sheepishly came to me, I realized I could not walk. After literally crawling back into the house, I called Toni – who was out of town – and told her I could not put any weight on my left foot. I declined to go to ER – they have better things to do at midnight than attend to 59-year-old morons – and went to my doctor the next morning. I had fractured my left fibula, which is a fancy way to say I had a broken leg; opting to avoid surgery, I’ll be in a cast and on crutches for eight to 12 weeks. After I got back from the doctor, I told Toni I wouldn’t be able to help around the house for quite a while. I think you know what her response was to that. To be sure, I am not very, very, very valuable to the Chad family, and I am only sorely missed on trash-collection days. Moral to the story: For Curry, steer clear of layup attempts and JaVale McGee; for me, steer clear of sprinklers and steps. 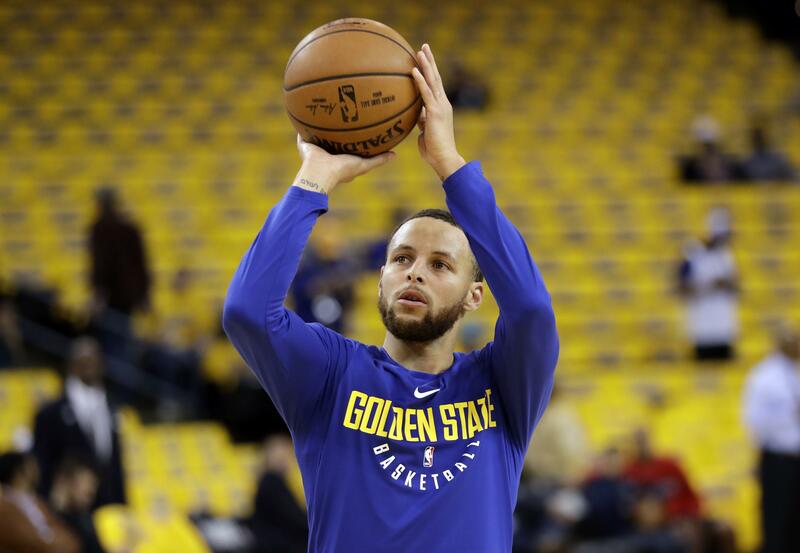 Curry has completed his rehabilitation – which involved bike, running, shooting and resistance band exercises, non-contact practices and shooting workouts and, finally, full-court contact practice – and will play in the Warriors’ second-round series against the New Orleans Pelicans. My rehabilitation entails elevating my leg on the couch while enjoying “Hill Street Blues” reruns and Signature Select Chocolate Moose Tracks ice cream. Daisy, meanwhile, has learned how to work the remote. A. I last watched the NFL draft in 2005; after intense therapy, doctors removed Chris Berman’s voice from my head by 2009. A. You appear to have a fundamental lack of understanding for the yahoo economy. A. That’s “Mr. Irrelevant, sir,” to you. Published: April 30, 2018, 7:16 p.m.